Only a handful of students are awarded scholarships by the Environmental Research and Education Foundation (EREF). 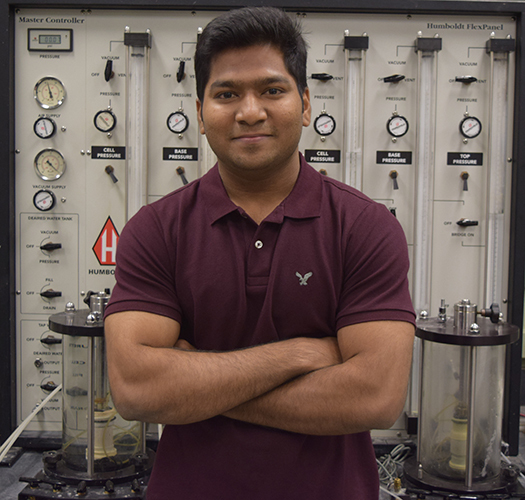 This year, UIC’s Girish Kumar, a Ph.D. student in the civil and materials engineering, was named a recipient. “My research is focused on understanding the fundamental processes that occur within the waste when it is dumped in a landfill and mathematically interpret those processes to be able to predict the behavior of the entire landfill system. This will ultimately help in designing stable, effective and, more importantly, sustainable landfills,” said Kumar. Kumar is working with his academic adviser, professor Krishna R. Reddy, the director of the Sustainable Engineering Research Laboratory and the Geotechnical & Geoenvironmental Engineering Laboratory, on an NSF-funded project to develop a practical and reliable coupled thermo-hydro-bio-mechanical model that can enable safe design and operation of stable, effective and sustainable engineered landfills.